Along with the kayak GIANNI DI BOLOGNA, Jon Raggett designed, built, and launched both of these kayaks in June 2001. These two K-1 Flatwater sprint boats are 17 feet long, 17" beam, and weigh just 18 pounds each. They are built according to the method of Platt Monfort's Geodesic Airolite designs. 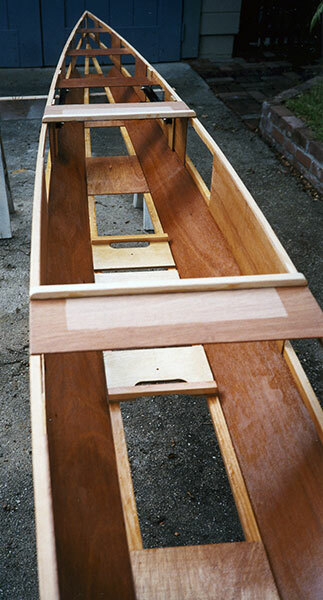 The framework of the hull is formed from 6 pieces of 1/4" x 1/4" Douglas fir running the length of the boat, and joined together with 1/8" plywood panels. Then this framework is covered with shrink-fit Dacron. Reach Jon at 26226 Camino Real, Carmel, CA 93923 or at kayakraggett@yahoo.com.